Once upon a time in 1948, in the small but growing city of Wichita, Kansas, while on the way home from church, Mrs. Adamson remarked to Mr. Adamson how much she’d like to have a hamburger. “Are you serious,” Mrs. Adamson asked. Two weeks later the Adamson’s were in the hamburger business. They named their first place Neal’s Burger Bar. 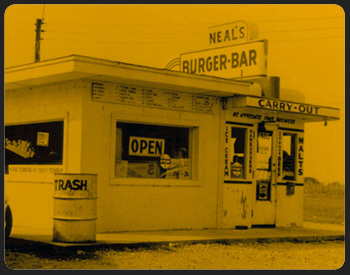 In 1956 they opened a second location and called it Neal’s Burger Bar #2. 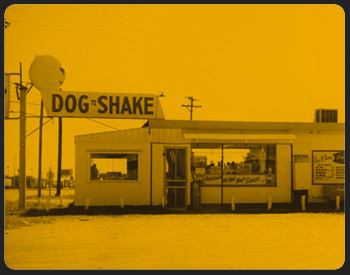 Two years later the Adamson’s purchased a Sizzlin’ Dog and in 1962 changed the name of the restaurant to Dog N Shake, thus founding the franchise name and a cheeseburger institution Wichitans have grown to love. 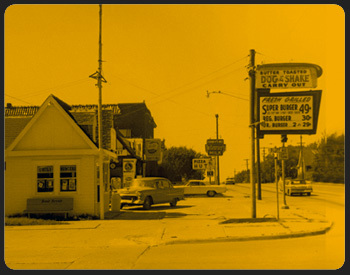 The Dog N Shake franchise continued to expand, adding additional restaurants in 1963 and 1964. Today, two of Neal’s daughters and a granddaughter are keeping the Dog N Shake tradition alive and well. 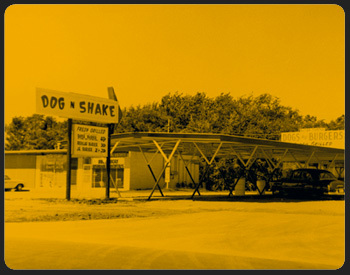 Dog N Shake restaurants are located throughout the city of Wichita, KS.